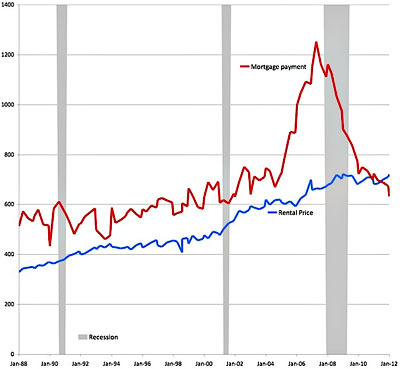 In the chart, the red line shows the mortgage payment you’d have to make if you took out a standard 30-year mortgage for the median asking sales price for vacant sale units. In reality, your mortgage payment would be lower, since this doesn’t take into account any downpayment. But in any case, thanks to ludicrously low mortgage rates below 9%, that number is now lower than the median national rental price. This is the first time that’s happened since 1988, and probably for quite some time before that, too. The question is: what does this mean? Option 1: Housing prices have overshot on the downside and are now due to rebound. Option 2: We’re not building enough rental units to meet demand. Option 3: There are so many foreclosed and underwater houses on the market that this is just the way things are going to be for a while. That’s the problem with data like this: it can mean a lot of different things, so it’s hard to say what its predictive value is. It’s also worth noting that things can vary a lot from place to place. The map below is a year old and based on a different metric, but it still gives you a decent idea of how things vary. In New York City, renting is still a much better deal than buying. 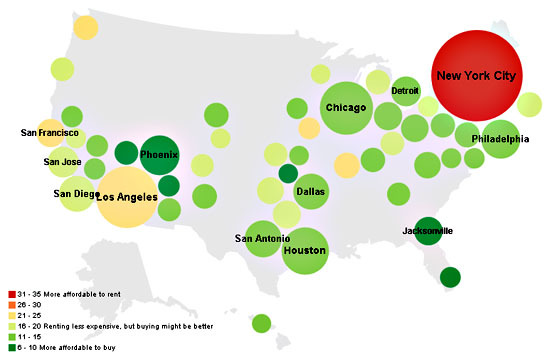 But buying is a better deal anyplace in green, and there are a whole lot of places in green. A 2012 version of the map would probably show even more.